Love is a lot of things. Love is patient. Love is kind. Love is stressful. Love is gross on a crowded train. We could go on and on, but the point of this blog isn’t to discuss all the things that love is and isn’t. We’re here to ask that ever-important question everyone ponders when Valentine’s Day is right around the corner: Is love good for your skin? This is a tricky question since the concept of love is such a nebulous thing. So, in order to make things more black and white, we’ll be using cold, calculated science to define love by the chemicals your body releases throughout the three stages of love put forth by anthropologist and human behavior expert, Helen Fisher of Rutgers University. These three stages consist of: lust, attraction, and attachment. For each stage, we will judge chemicals your body produces on the patented Ryan Gosling pass/fail scale: If they are good for your skin, they’ll get a loving Gosling. 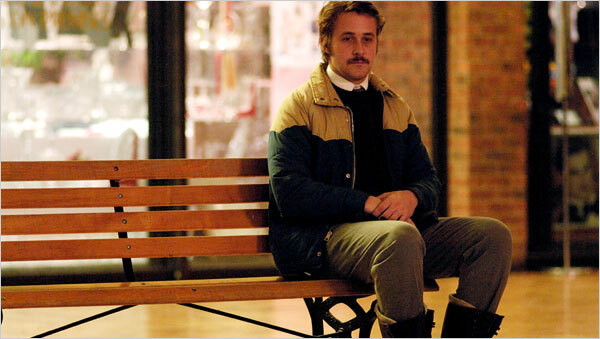 If they aren’t good for your skin, they get a lonely Gosling. Doesn’t get much simpler than that. Let’s get started. The initial stage of love taps into our raw, animal magnetism towards certain people. It’s what some mistakenly label as “love at first sight”, but really its your inner cave-person deciding that starry-eyed dreamboat you locked eyes with across the room could possibly be a suitable mate. Your blood starts pumping, your heart is beating out of your chest, and your body begins producing lots of estrogen and testosterone (for both males and females). Estrogen, primarily in females but to a lesser degree in males, has an effect on the structural integrity of your skin, as well as its moisture. When estrogen is present, it can bolster the production of collagen, which keeps your skin tight and wrinkle-free and can also increase certain glycosaminoglycans, chemicals that aide in the moisture balance of your skin. Overall, estrogen keeps your skin youthful and beautiful. Testosterone, on the other hand, increases the production of sebum in your skin which throws off its moisture balance and can lead to an oily complexion followed by an acne breakout. Testosterone is of course the male hormone, so it primarily effects men, but women still have testosterone (in the form of androgens) so ladies aren’t quite immune to its effects. Although that overly-aggressive male hormone makes this initial lust stage a bit contentious, the net positive effects of estrogen carry it into the win column. Congrats, you crazy kids. Oh crap. That starry-eyed dreamboat you locked eyes with is walking over. What do you do?! Your mouth goes dry, your palms get clammy, and where did all this sweat come from?! Damn you, body for producing so much of this adrenaline! Adrenaline (epinephrine) is often the body’s response to a stress which contracts both the arteries in your skin to divert blood flow to your muscles and the smooth muscles in your skin causing your hairs to raise and giving you goose-bumps. Even though the body’s rapid production of adrenaline in stressful situations is necessary and could save your life one day, stress of any kind is not good for your skin. Your skin needs a healthy amount of blood flow in order to perform it’s natural functions so when your blood flows elsewhere, your skin suffers. Dopamine is a pleasure-casing chemical, closely associated with desire and reward often found in newly love-struck couples. But, unfortunately enough, dopamine has a dermal reaction similar to adrenaline, only compounding its negative effects. Things aren’t all bad in the attraction phase, however. Serotonin is released in low levels during this phase which helps to balance out the burning, fiery passion brought on by adrenaline and dopamine. Serotonin generally makes you feel relaxed, happy and confident and without it, you would likely be more crazy about your new found love than you already are. As far as skin goes, relaxed is good so serotonin falls into the positive column overall. Despite the last-ditch effort of serotonin to keep this cauldron of love-stew from boiling over, the overwhelming effects of adrenaline and dopamine are just too much and result in a net negative for your skin. Sorry, Ryan. Finally, let’s just say everything went well with your hypothetical starry-eyed dreamboat, one thing lead to another, and all the sudden you’re in a relationship. Once said relationship is consummated (the exact moment, if you catch our drift) the chemical oxytocin is released in women and vasopressin is released in men. These chemicals are structurally very similar to each other and cause intense feelings of attachment, cementing bonds between two people. Neither chemical has an incredibly direct effect on your skin, but they do both have an overall calming effect, which is always good for your skin. Vasopressin is also responsible for retaining water in your body so it indirectly benefits your skin’s moisture levels as well! We are happy to say that, since there are no obvious negative effects of oxytocin and vasopressin, the final attachment stage of falling in love is in fact good for your skin! What a relief! There you have it, ladies and gentlemen. According to the arbitrary amalgam of random pieces of research culled from the far corners of the internet, love is undeniably great for the look and feel of your skin. So what are you waiting for? Get out there and find your own starry-eyed dream boat! Your youthful skin will thank you. Oh, before you rush off! Valentines day is coming up so if you want amazing skin before you fall in love, or if you want to give your loved one the gift of incredible skin, Lira Clinical has everything you need to glow this February 14th!